EACTS provides high quality training courses that are attended by delegates from all over the world. As an educational institution, our goal is to promote a non-dogmatic learning environment that brings together people, cultures and ideas from around the world, changing lives, and helping to transform through education. *Please note that we a require a minimum of 4 participants for this course to proceed. This specialist course will be held at the Medizin im Grünen facility in Wendisch Rietz, just outside Berlin. A medical centre of excellence where delegates will receive intensive simulator learning and training in different patient simulations in an extremely modern operative environment. Basic principles of cardiac surgery part II. The course will encompass the essentials in aortic surgery, congenital cardiac surgery and the surgery of heart and lung failure including mechanical circulatory support. The Thursday of the course will offer expert hands-on wetlab training. 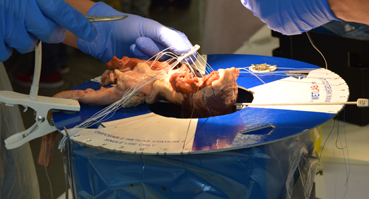 A level 3 skills course including live cases and live-in-a-box videos on the surgical management of all anatomical forms of transpostion of great arteries. Basic principles of cardiac surgery part III. The course will cover the following topics: Mitral and tricuspid valves, arrhythmia, endocarditis, hypertrophic obstructive cardiomyopathy, carcinoid and aortic root. The course will offer expert hands-on wetlab training.